I blame it on my new lipstick. The shade, called “Classic Wine”, is much more exotic than I’ll ever be, but still, it did look lovely. I’m not much of a “check-my-look-in-the-mirror” kind of girl, but I couldn’t resist. Perhaps this momentary bout with vanity, me looking in the visor mirror to admire my look, explains how I ended up where I did, with the tow truck operator shouting, “Try to have a better day!” and me responding to him, “I bet you say that a lot”, and him chuckling and waving as he drove off. It happened at church. I was at the first meeting of a women’s spirituality group. I came with every intention of getting this serenity thing nailed down once and for all. It was not to be. Our opening mediation was interrupted by an apologetic Pastor Bradley wondering, “Does anyone here drive a Mazda Protégé?” Well, that would be me. I was actually borrowing my son’s car, taking it out for a spin, since he was out of town. That little car had beckoned me, “Come, prove to the world that you know how to drive a stick shift!” When I tell my children that yes, indeed, Mother does know how to drive a car with a manual transmission, they scoff. Well, their grandpa can tell them that he taught me how to drive in his Buick Skylark. The one with 3 gears (plus reverse) on the steering column. So there. It appears that I forgot the last best lesson of driving a stick shift: that a person really must put the car into gear before they walk off. Pastor Bradley walked with me to the door, treading lightly, explaining that he had looked out his office window to see that the car had rolled away from its parking spot. Well, that’s a little embarrassing, but, I thought, manageable. Little did I know. The scene that greeted me was stunning. The car had rolled all right. Right into and over the hedge in front of the church. There it was, perched on top of the bushes, which had been flattened while trying to hold up this errant vehicle. Soon, everyone had to come out and take a look. All the pastors, all the office staff, every dang person out for a walk down that busy street. 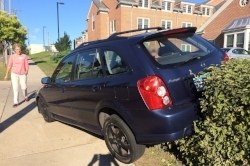 People were driving by oh-so-slowly to catch a peek of this automobile balancing on one tire, firmly planted in a hedge. Some were even taking pictures! Really. Everyone was laughing, great huge belly laughs, wiping away tears from their eyes, all the while apologizing to me for their unbridled mirth. I shouted to the little crowd, “Do NOT post this on Facebook!” The pastors gave me a “What, who, me?” look, which I saw right through. They were dying to run upstairs and post it for all the world to see. The tow truck arrived and pulled the car off of the poor dilapidated hedge. That’s when the driver bade me a better day. Later, I got an email from Pastor Bradley. He told me that the mail carrier had taken a picture of the car, and had posted it on Facebook. My, but they were having fun with this. So, outside of a scratched bumper and a scratched ego, a mangled bush, some mail carrier’s Facebook page with incriminating evidence that may or may not be used against me, and a son who will not be pleased (he loves his car even more than his mother), things surely did not turn out too bad. But then there is the embarrassment, the unwanted attention, the knowing that every time someone pulls into the church parking lot, they will see the bush and think of me. And laugh. I’ll never buy new lipstick again.